Tuesday, May 23, 7:30 p.m. The legendary British rock 'n' roll band Jethro Tull has existed in one form or another for a half-century. 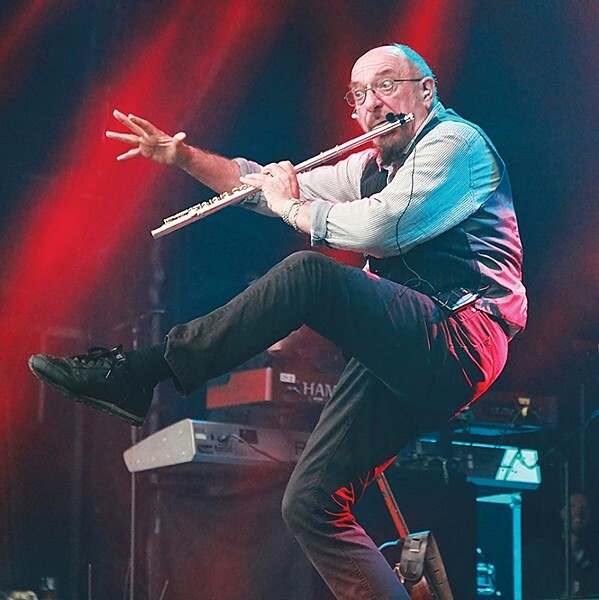 From their beginnings in Luton, England, the group's mainstay has been Ian Anderson. As songwriter, singer and multi-instrumentalist, Anderson cuts a distinctive and flashy figure—his trademark one-legged flute solos accenting the band's reliably high-energy performances of folk- and blues-inspired progressive rock. Today, at 69, he still leads a version of the group, billed as "Jethro Tull by Ian Anderson," performing new solo and classic Tull material. He has always aimed to provide audiences with high value for their concert-going dollar, rather than "just straight-ahead walking on the stage and playing the music," Anderson says in a telephone interview. Nowadays, that means adding an impressive multimedia component to the band's performances—but supplementing, not supplanting, the experience. In an era where fans pay big bucks and are lucky to see the band in miniature from a distance, Anderson is mindful that a live performance means seeing the artist in the flesh, not digitally rendered images on XXL LCD screens. He believes audiences are increasingly tired of this and "expect something more than just a bunch of distant bodies on the horizon wearing T-shirts and jeans," he says. Multimedia isn't that new. Bands like Tull have employed flash pots, lasers and video for decades. But technology should be an enhancement used, as Anderson puts it, "to express visually an accompaniment to the music." Sometimes that's achieved through creative lighting controlled by an off-stage director who works with the artist to ensure the impact is, ideally, "quite abstract and gentle." That way, the band—and their songs, like "Aqualung" and "Locomotive Breath," remain the focus. On this tour, there are also living, breathing embellishments, such as guest performers who play characters in a lyrical fashion, adding further life and dimension. "In a couple of places I have a guest vocalist who pops up and sings a few lines in a song," Anderson says. Interestingly, big-screen video projection does find its way into the performance at key moments, but in tasteful doses. He stresses that any extras are "benign illustration. It's not as if somehow we are accompanying a video; we try to keep it the other way around. A video is just an additional visual effect." He strives to avoid the popular practice of projecting close-up shots of the musicians as they play—not only because it puts distance between artist and audience in a setting meant to bring them closer, but also because it presents a visual and auditory dissonance. "The time lag between the camera recording the action on stage and it appearing on the screen can be half a second or even more," he explains, recalling a recent experience at another well-known band's concert where "system latency" presented quite a problem. The delay, he says, "actually had got so far out that it looked like it was in time again. It looked as if the drummer was playing on the off-beat." With a wry chuckle, Anderson adds, "You won't find that at our concerts." At his shows, onscreen images are synchronized. "Our drummer, God bless him, is having to follow a time code, and we play with him." After 50 years, he's just happy to be able to put on good shows for paying fans. "It's an opportunity, rather than some kind of penance to suffer."